1. There are articles here on collaboration and mentoring. We like them. We think you’ll like them, too. 2. We began our own years-long series of collaborations in the early 2000s, first in a graduate seminar focused on pedagogy for interdisciplinary graduate students, and then later extending our work together to professional presentations. We have seen our professional relationship shift and grow through our various kinds of collaborations, have weathered it when it has become fraught and complicated and messy. We have celebrated it when it has felt rewarding (and produced welcome results), when it has provoked us. And we continue to value collaboration and mentorship as fundamental to how we work within our different areas of academia. This special section has allowed us to cultivate writers who take up ideas around mentorship and collaboration in interesting ways, and we’ve welcomed the opportunity to work with them. 3. With much of our lives woven through shared Google Docs, around Twitter feeds, and with visits to LinkedIn, the spaces where personal and professional collaboration happen have become ubiquitous — once there were the Yellow Pages, now there is Yelp. Facebook, for example, has for some become useful “for professional conversations and [as] a social network that enables users to create and maintain social capital” (Briggs). This special section, as you will read, helps us think more slowly, with more clarity, about how and why we might use and revise our uses of interactive technology a writers, as teachers, as colleagues. 4. The writers collected here for this special section think large, pushing our uses of interactive technologies toward serving and enhancing international service-learning projects (Oppenheim, O’Shea, and Sclar). They also consider the pedagogical implications and complexities of mentoring in graduate and undergraduate course work: Macaulay-Lewis articulates a project for graduate students to develop digital skills that will serve them professionally, while Crocco challenges undergraduate writers through critical simulation pedagogy to collaborate on joint projects. Others, like Kuhn, Wipfli, Lipshin and Ruiz, place their seemingly disparate courses together pedagogically in order to enhance the intellectual experience of both courses. Skallerup Bessette tests our assumptions about how we represent collaboration (and how we recognize collaborative academic work: variously, inconsistently) through narrating her experience in a Twitter community around #FYCchat (take a look and jump into the fray). Zabrowski and Rivers formally enact their inquiry into their own mentorship and collaborative relationship, reflecting on rhetorical and material “space” in intriguing ways. 5. In this time of (relatively) easy heightened interaction through technologies, we holler encouragement to friends around the globe in comment sections, we make suggestions, we offer critique. We hope you consider this section as an invitation to do the same. Digital media, deployed in the service of real world issues, have the potential to foster the type of collaborative learning needed to prepare for the dynamic, interconnected world of the 21st century. In this article, we describe a project in which two university-level classes, one in new media and one in global health, were combined in order to improve the learning experience of each. While studying the complexities of global health can illuminate issues surrounding large-scale digital literacy in a globally networked world, working with multiple digital tools can prepare students for the complexity of a career in the field of global health. It has become impossible to ignore the fact that the cultural and technological shifts responsible for a globally networked world have also rendered many conventional approaches to university pedagogy untenable. As such, many universities are exploring ways to enhance the undergraduate experience, often via the integration of emergent technologies. Against this backdrop, we embarked upon an educational collaboration, receiving support from a competitively awarded fund for innovative undergraduate teaching on our campus. During the spring of 2012 we paired two upper division courses taught in two disparate programs at a research university—New Media for Social Change and Case Studies in Global Health. Both classes served relatively new academic programs: a minor in Digital Studies at the Institute for Multimedia Literacy (IML) and a major in Global Health offered by the Institute for Global Health respectively. While the classes were taught concurrently, we strived to ensure that each retained its core academic integrity. The classes combined a curriculum, though from an administrative perspective, they remained separate. Given the resonance between the two disciplines, we imagined that this pairing would enhance the intellectual experience of each: while the field of new media or digital studies attends to the interrelationships among technology, culture, communication, and expression across the registers of text, audio, video, and interactivity as they impact large-scale literate practices, the field of global health investigates the close interplay between medical, economic, geographic, and environmental factors as they impact human health. Both disciplines require knowledge of the systematic complexity that characterizes our highly mediated, globally networked world. The exploration of real-world issues underlies both disciplines and is, or perhaps should be, a fundamental component of both educational programs. Further, both are iterative and dynamic in their scholarship, and their researchers seek to uncover solutions to complex problems by collaborating in academically diverse teams. Moreover, even as researchers in both fields tend to make decisions based on varying degrees of available data, they do so with a keen awareness of the extent to which change in one element of a global system affects all others. In sum, the classes seemed a natural fit for collaboration. In the recent book Cheating Lessons: Learning From Academic Dishonesty, James Lang (2013) surveys academic dishonesty from ancient Greece and China to the present day and arrives at four features of environments that discourage cheating and, by extension, tend to foster learning. These environments are characterized by the following features: 1) they are mastery based, rather than performance based; 2) they offer intrinsic motivation; 3) they promote a high expectation of success; and 4) they offer many types of and opportunities for assessment (rather than a single high-stakes measure). Cheating Lessons is emblematic of the recent debates about the state of higher education and the growing interest in the scholarship of teaching and learning. With the benefit of some critical distance, we now ask ourselves how we might view this effort using the features of Lang’s successful learning environments. To back up for just a moment, we should note that the two faculty members already had a working relationship. We were two of only three faculty sent by our Provost’s Office to present at a conference in Washington, DC, that was geared to reinventing undergraduate education in Research I universities. We also collaborated on a project for ABC News and the Gates Foundation, creating a Facebook game, One Thousand Days, that teaches the importance of early childhood nutrition. Our collegiality and shared commitment to teaching were instrumental in the decision to pursue this project, and the funding we received was also integral since it allowed us to: 1) hire a research assistant, Jason Lipshin, to help with planning in advance of the course; 2) send Jason to train on ArcGIS (i.e., on adding data to maps); 3) conduct planning meetings; and 4) purchase some materials such as books and hard drives. Finally, we were both deeply involved in establishing our respective institutes’ curricula, and this helped us manage both conceptual and logistical issues. While the classes we combined were intended for advanced students in each program, we hoped that the lessons learned, the methods established, and the materials created would be of more general use in university pedagogy, particularly for those who teach at institutions with less access to material resources and less time for experimentation. We now see that the most compelling portions of the class included features of Lang’s criteria for successful learning environments, and like Lang, who culled educational insights from studies of cheating, we found that the resistance we encountered from students was just as instructive as those aspects that seem most immediately successful. We should note from the outset that we approached this project with a belief in the efficacy of small class sizes and a distinct skepticism of the lecture model with its “sage on the stage” approach. We agree with Paulo Freire’s prominent condemnation of the banking system of education, whereby students are posited as empty vessels just waiting to be filled with faculty wisdom. We profess a constructivist approach to knowledge, one that is situated, active, and rigorous. Logistically speaking, each class was listed and enrolled in its home department, but scheduled in the same room. Each class enrolled about twenty students for a total of forty-three, and each had a faculty member as well as a graduate teaching assistant assigned by the department—Susana Ruiz for digital studies, Allen Shu for global health. In preparation for the class, we asked ourselves what sorts of projects would help to foster the goals of each discipline. The two faculty members met frequently with Jason, the research assistant, during the semester prior to the class. During the semester the class was convened, the meetings expanded to include the two teaching assistants. After some background work on the ethics of representation, the relative nature of power and privilege, and global health statistical reports, we divided the course into three main units, each lasting about five weeks. Each unit contained a corresponding multimodal project: 1) visualization of public health data; 2) geospatial disease mapping of the contemporary cholera outbreak in Haiti; and 3) a video-based argument around complex issues associated with HIV and the law. We used emergent tools that allowed students to engage research in multiple formats using numerous methodologies. Students were also tasked with weekly reading responses that included selections from both fields, and the two group projects required a mix of students from both classes. All course materials were distributed and all student work was submitted using a course wiki that was password protected. In what follows, we describe the three units, their rationale, and an overview of the project assigned to each, after which we enumerate some of the lessons learned. These insights were gleaned from a variety of sources: our own impressions, student reflections, course evaluations, and an examination of the projects created. We conclude by assessing the course through the lens of Lang’s criteria for successful learning environments. We also include some ancillary materials: students were filmed at the close of the course, and their reflections, as well as the projects created for the class, were gathered and placed online using a WordPress site: http://iml420.wordpress.com/. These materials, which are embedded throughout this article, are included as evidence, so that they may illuminate the claims we make about the course, even as they might also serve as models for future courses or for units within more traditional class settings. Indeed, the two faculty members have made use of the materials in subsequent classes, and the video-based projects have been shared widely including their circulation during the International Conference on AIDS (hereafter referred to as AIDS 2012), which took place soon after the course ended. The graphical representation of information, a practice referred to as information visualization or data visualization, comprised the focus of the first unit. In 1945, Vannevar Bush decried the deleterious effect of information overload and poor data management. More than half a century later, the trend has increased exponentially, as data deluge and the complexities of a globally networked world amplify the situation. Thus, it is no surprise that the visual display of information has exploded as a means of representing these vast datasets, necessitating critical engagement with their visual expression. We also believe that critical engagement with any semiotic system includes consumption as well as production since it can be difficult to understand the rhetorical choices involved in creating a graphical representation without actually having made those choices. When visualizing information, certain elements of the data are suppressed in order to emphasize others. For instance, subway maps tend to sacrifice geographic accuracy in order to accentuate the paths of the various routes. As such, this assignment asked students to investigate the ways in which data become information and, further, to explore the ways that information shifts its meaning depending on its context and mode of presentation. This early focus on data fulfilled another of our goals in terms of interdisciplinary efforts. Data gathering is often viewed as a pivot point at which the hard sciences and its methodologies depart from humanistic or artistic types of inquiry. Indeed, when discussing the early readings—a bulletin titled Global Public Health: A Scorecard (Beaglehole and Bonita 2008) and a few chapters from Allan Johnson’s Privilege, Power, and Difference (PPD)—one student suggested that the global health readings were more valid, scientific, and evidence-based since they used statistics, while the PPD reading was merely anecdotal. This was the perfect opportunity to explore the very nature of research methodologies, allowing us to ask questions such as: what counts as knowledge in each field? Are interpretive methods purely subjective? What data is used in statistical models and how is a datum defined? Do statistical models in global health rely on self-reporting? If so, might survey data also be seen as subjective? How might mixed methods add veracity to a topic and make it compelling? Are there any statistics to be found in the narrative of Power, Privilege and Difference? A close reading of one paragraph, for instance, revealed at least five data points, but since they were presented in narrative form, they were not immediately recognized as such. Calling received wisdom into question became a key course theme, and we believe this type of “defamiliarizing” of knowledge is vital to critical thinking. The information visualization assignment was the only individual project, and although no professional-level tools were required, students were asked to use at least two tools and to create four different visualizations of the same data points: a pie chart, a bar graph, a box plot, and a heat map. In this way, it became a comparative project that complicated the very nature of these images that are rampant in the media. Students were further encouraged to step outside of their comfort zone: we hoped the global health students would eschew their go-to tool, Microsoft Excel, and that the digital studies students would eschew their general anxiety about using statistics. Students were required to submit a project plan with an overview of their chosen health-related dataset and its provenance, as well as the types of visualizations they planned to create. An ongoing list of resources was available via the course wiki, from the conceptual Periodic Table of Visualization Methods to tool-based sites such as ManyEyes and Gapminder, both of which offer access to datasets as well as the ability to upload one’s own. Requiring a project plan allowed us to offer input and suggestions while assuaging some of the concerns students voiced about the experimental nature of the course. The global health students, who were mostly pre-med, tended to be more comfortable with a single correct answer and necessarily more concerned with their individual grade point average, an understandable concern given the competitive nature of medical school admissions. The project also required students to write a two- to four-page report describing and contextualizing each visual they produced, and this, we noted, gave them the opportunity to explain any failures they might encounter when using new applications. Students also had the opportunity to briefly present their work in class, which gave them a further opportunity to articulate goals that might not be apparent in the final project. While the information visualization assignment was effective in introducing students to issues in the filtering and representation of complex data, the formal parameters of the assignment necessarily limited the conceptual scope. Although statistical representation has long operated as an important genre for both conducting global health research and communicating that information in diverse contexts, it also became increasingly clear to us during the progression of our first unit that representing the complexity and dynamism of global health problems remains difficult when using only static visualizations. Thus, in our second unit’s disease-mapping project, we sought to move from representation to simulation, building upon many of the skills introduced in the first assignment while also more fully integrating systems thinking on both conceptual and formal levels. 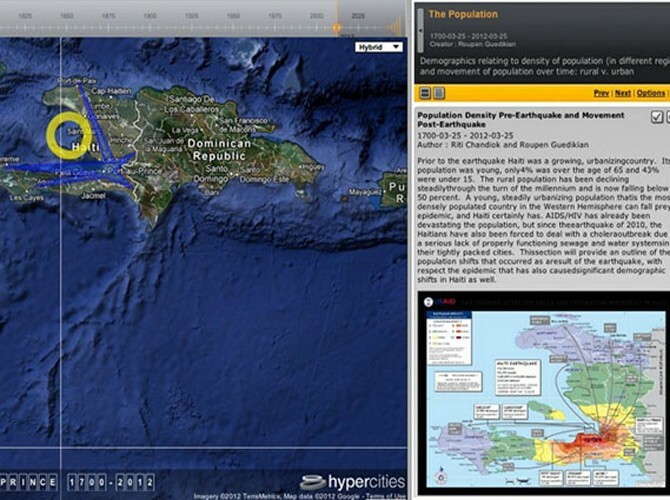 Using the interactive mapping platform Hypercities, we asked students to collaborate with peers from both global health and digital studies in order to create a media-rich map of the multiple forces contributing to the 2009 outbreak of cholera in Haiti. We assigned the four groups and their topics as detailed below, although we did give students a chance to request a change. We began the second unit began by reading Steven Johnson’s The Ghost Map (2006)—a historical account of how John Snow, “the father of modern epidemiology,” tracked the source of the infamous 1854 outbreak of cholera in London. In charting Snow’s inquiry, we emphasized Johnson’s characterization of Snow as a systems-level thinker, drawing connections across anthropology, urban planning, and the life sciences, while also encouraging students to consider the important role of mapping in providing context and visibility to these transversal relationships. Having introduced students to Snow’s interdisciplinary methods for investigating cholera in 1854, we presented the interactive mapping assignment as a way to connect past and present, asking students to consider how similarities and differences in social, technological, and geographical contexts might be brought to bear on the construction of our collaborative project. To illustrate the value of interdisciplinary approaches, we had a visit from a documentary filmmaker who screened his filmic reenactment of Snow’s discovery. Guided by Johnson’s narrative about how to represent and make use of complexity, we were particularly animated by such questions as: how might the need for interdisciplinary and systems-level thinking be amplified in a globally networked society? What might “the ghost map” of the 21st century look like? And how could it be used to trace the complex set of forces that led to the 2009 outbreak of cholera in Haiti? GROUP I, PEOPLE: Population characteristics (density, socio-economic status) and refugee camps. GROUP II, WATER: waterways (natural and municipal), power sources; and waste management. GROUP III, CARE: Health systems (health care services/clinics, medical schools, and disease distribution). GROUP IV, INTERNATIONAL AID: International aid, international focus, UN peacekeepers, and NGOs. Within each group’s layer, students were encouraged to present their research across multiple registers—from text and image, to video and information visualization—and think about the various potentials and limitations of each form. Students were also urged to think about the specifically spatial and temporal qualities of their argumentation, teasing out what it would mean to design their research in ways that depart from the traditional academic paper. It is, perhaps, in this latter aspect that some of the most interesting outcomes of the project emerged, as Hypercities (built on the Google Maps API) holds many time-based affordances, which are quite rare among typical mapping platforms. For instance, Hypercities includes the ability to specify the time frame in which a particular point appears and the ability to place points in a linear narrative sequence. This time frame feature allowed students to explore differences in data before and after the 2009 earthquake, while the narrative feature allowed groups to effectively create virtual “tours” of the crisis, crossing vast geographical distances and toggling between local and global scales according to the rhetorical needs of the particular argument (please see accompanying screen shots and overview video). Such unique features contributed to the emergence of many compelling and innovatively structured arguments. But we soon realized that it was much more interesting to see each group’s layer in conversation with others: to see the ways that one kind of data interacts with another in a complex system. For instance, by toggling on layers of data from two groups simultaneously, we were able to see the ways that sources of drinking water intersected with waste management systems, providing a visceral portrait of how cholera was transmitted in and around Port-au-Prince. Likewise we were able to see the ways that high mortality, lack of adequate health care facilities, and low socioeconomic status often overlapped, providing students with a stark picture of how aid in disaster contexts is often unequally distributed along class lines. Thus, while each team researched in relative isolation and plotted their data as a discrete “layer” within the Hypercities map, it was only in seeing the multiple overlaps and intersections between economic, social, political, and biological factors that more telling insights could emerge. Figure 1. 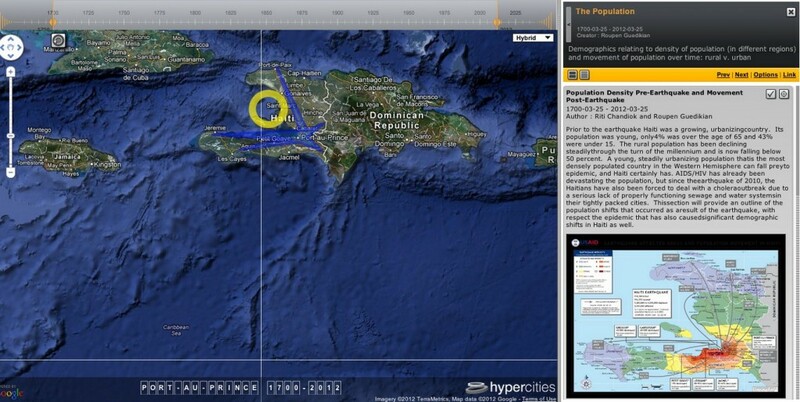 A screen shot from the class project in which students mapped the cholera outbreak in Haiti using the Hypercities platform. Figure 2. 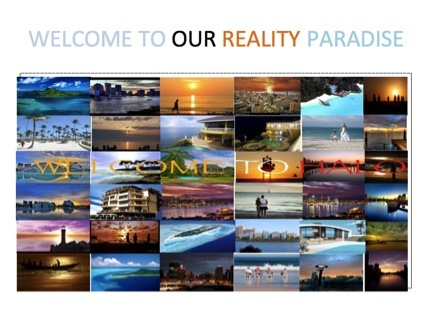 Screenshot from Hypercities class project on Haiti. Figure 3. Screenshot from Hypercities class project on Haiti. The third unit of the course centered on HIV, AIDS, and the law, and was tactically deployed in anticipation of the XIX International Conference on HIV and AIDS (a.k.a. AIDS 2012) slated to convene in Washington, DC, a few weeks after the course’s completion. This was the first time in twenty years that the conference was held in the United States, a fact due mainly to a shift in policy that had heretofore been inhospitable for visiting AIDS activists and those living with HIV, many of whom are one and the same. Using video testimony from the Commission on HIV and the Law’s regional stakeholder consultations as a jumping off point, student groups focused on the production of research-based video arguments, or what we refer to as digital arguments. In constructing their digital arguments, students were expected to use the available semiotic resources—text, sound, still and moving images, and animation/effects—to create a nuanced and sophisticated academic argument about some aspect of the complex issues related to HIV and the laws that govern its research and treatment. During this unit, students read 28: Stories on AIDS in Africa, a monograph by journalist Stephanie Nolen (2008), as well as policy briefs and peer-reviewed articles about the relationship between HIV and the law. In addition, we had a guest speaker, a colleague who is a noted legal expert in the field. The project associated with this unit moved more closely to established pedagogical approaches: video-based or digital argument is a foundational assignment developed at the IML and modeled in other new media programs in the US. Unlike new media programs that have grown out of English departments, writing studies, or schools of communications, the IML’s location in the School of Cinematic Arts has meant that there is a strong emphasis on images—both still and moving—founded on an awareness that digital technologies are as amenable to images as they are to words. Founded in 1998, the IML has expanded its focus to include interactivity, networking, social media, physical computing, and geospatial technologies, yet the emphasis on images remains a vital one. Concurrent to the study of HIV and AIDS, the global health students received training in how to find, capture, and convert existing video assets, followed by a brief overview of professional editing tools. The IML students, already well versed in these applications and workflows, were given tutorials in special effects based on kinetic typography in order to help them animate dynamic visualizations to enhance the testimonial footage. For this final project students working in groups of three or four used stakeholder testimonials and additional news reports, images, original text, voiceovers, and music to construct a five- to eight-minute video argument covering some aspect of the ways that laws impact HIV prevention and treatment around the world. The project’s scaffolding included an ideation stage during which groups discussed their ideas with one or more of the teaching staff. We also required rough cuts that were screened in class, allowing each group to receive feedback and ideas for completion. The labor required to complete production-based projects is often underestimated by students and often invisible to faculty unaccustomed to teaching them. As such, it is crucial to build in these milestones. The resulting projects were incredibly rich and well researched, and they covered a wide range of issues with more depth and nuance than we had imagined going into the unit. For instance, one group explored the complexities around the treatment of migrant workers—there are 105 million worldwide—who are often treated as criminals and deported from the country if they contract HIV, regardless of the country of infection. Another group explored the linkage between domestic violence and HIV, showing the ways in which women, particularly those in deeply patriarchal cultures, are often infected by their husbands and then left with few options. Divorce is taboo and even testing and treatment is untenable since it brings shame. The emotionally laden approaches to needle exchange programs were addressed by another group, while yet another explored AIDS in the US and the delicate balance between public safety and individual privacy. This highly successful unit was a great way to complete the course, and while viewing these videos one after another, one notices a certain over-reliance on kinetic typography (words that are animated to move across the screen in interesting ways), the technique that IML students learned during the unit. However, it is also evident that the IML students took the unit seriously and pushed themselves to acquire new skills—there was no project requirement to use the technique—while it also meant that the global health students participated in the production work, doing some of the less sophisticated tasks such as capture, compression, and rough cut editing. Moreover, sequential viewing of these projects is not the norm, even as individual videos have been viewed far more widely than a text-based equivalent such as a research paper would have been. Indeed, students noted having sent their video projects to friends and family, and many of them shared their work via social networking sites. 1) It was mastery based, as opposed to performance based. There were no tests requiring rote memorization or the type of cramming of facts that may soon be forgotten. The work was tied to real-world events in a way that encouraged mastery, we hope, rather than a single high-stakes performance whose outcome would be final. 2) The main assignments were project-based, and the projects were designed to foster intrinsic motivation by giving students autonomy in setting their own goals insofar as was viable. The assignments included enough structure to ensure rigor, but enough openness to allow students to take an approach that was meaningful to them either personally or professionally. Moreover, seeing others students’ work during presentations may effectively raise the stakes as students put their best foot forward as a matter of pride. 3) The course offered many modes of assessment: not only were the projects themselves evaluated, but so too were the weekly reading responses, the reflective essay in the second unit, and the oral presentations for each project. Students also had the opportunity to articulate their difficulties and to revise their work in light of feedback from both peers and instructors. 4) Lastly, the course offered a high expectation of success. There was no curve to the grading process in either class and no reason all students could not do well. 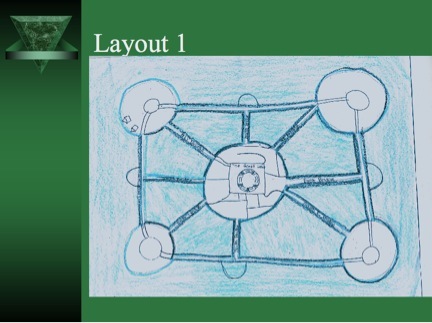 Each project and its requirements were carefully explained in class and models were offered for each unit. In addition, we provided resources—access to both faculty and TAs, as well as lab techs and software tutorials—so that students could stretch themselves beyond course requirements should they desire to. Even as the course seems to have more than met these features of successful learning environments, there were several challenges, and these are, perhaps, the most useful to enumerate as they prove enlightening. We briefly sketch them below. Establishing and managing group work among students is always a somewhat dicey issue, particularly given the fact that faculty assign grades separately. The first project, which centered on visualizing health data, was undertaken individually, and this may have inadvertently shown students the value of collaboration: When presenting their work in class, the IML students suggested that they struggled with the statistical aspect of this assignment, while the global health students remarked upon the design prowess that they saw in their colleagues’ projects but felt lacking in their own. They seemed happy to know that the next two projects would be group work. Unlike the first assignment, the second project—disease mapping with the Hypercities platform—was collaborative. The groups were relatively large: four groups of ten or eleven students each. We were fully aware of the logistical obstacles of a group this size; scheduling a common meeting time for instance, would be daunting, especially for juniors and seniors with full course loads in addition to the demands of internships, part-time work, extracurricular activities, and the like. Conceptually speaking, this size could also be a problem in terms of leadership, decision-making, and the distribution of labor. On the other hand, in some ways we saw this assignment as a class-wide endeavor (and it truly was experimental since none of us had used the platform heretofore, even as the IML faculty member and TA were well acquainted with it), and so breaking it up this way felt to us more like splitting the one large group into quarters rather than building large groups of students. We advised students to use collaborative tools like Google Docs for planning, and to also break into smaller groups within the larger one. Moreover, as we told the class, working in groups will be a regular part of life after school, and so making decisions about how to navigate such efforts is always a useful endeavor. We urged students to make this a learning experience at the meta-level as well as at the curricular one. What will you do, for instance, when a group member fails to complete a task? Would you handle it the same way in a work setting? How will you address intragroup conflict? We wanted to give students agency along with all the responsibilities that accompany it. During course planning meetings, we actually reveled in the differences we uncovered, finding them to be a great source of new knowledge and a chance to reexamine our own thinking. As faculty, we felt such differences in disciplinary approach would enrich the experience of the class and remind students of the possibility that other truths existed beyond their own worldview, while it would also demonstrate the importance of context. For instance, the issues surrounding the way technologies of surveillance operate tend to be viewed differently in each field. In global health, the beneficial nature of surveillance tends to dominate: Not only does such scrutiny allow for more accuracy of data collection, making epidemics easier to track, it can also help with monitoring health care compliance. By contrast, the oppressive nature of surveillance technologies tends to be the focus of new media studies, where it is seen mainly as a disciplinary measure with the potential for abuse by ideological state apparatuses (cf. Althusser, Foucault). Indeed, a regular part of the IML’s foundational course sequence includes a camera assignment in which students create an argument about some aspect of private and public space. They are asked to research and speculate about issues such as whether the increasingly ubiquitous cameras in public places protect individuals from crime or simply provide the means for keeping them in check. Adapting this project for the combined class initially seemed interesting and provocative, but in the end, the skills and resources necessary felt prohibitive; not only does this project require extensive instruction in techniques for shooting film (framing, lighting, sound, etc. ), the number of cameras, sound kits, and hard drives required would drain equipment stores when they were needed for IML courses with required camera projects. Further, the video project on HIV and the law seemed more valuable, both conceptually and practically: The global health faculty were offered access to this testimonial footage, its topic was germane to the project, and working with found footage not only requires less equipment, but editing professionally shot footage is also a valuable in teaching one about the way a visual argument is framed. That said, during class we did not attempt to hide our differing views on surveillance and other topics, though we did so in a respectful way. Still, some students expressed discomfort at the lack of a single definitive approach to such issues. If one of Lang’s key features of successful learning environments lies in the presence of multiple opportunities for evaluation, the relationship of such evaluation to grades is worth considering in more detail. As we noted previously, students were often likely to seek a single and uncontested correct answer, and this tendency we have found to be more pronounced in the hard sciences. Undoubtedly, the data-saturated culture that permeates contemporary educational institutions has amplified students’ need to attend to data points such as test scores and grade point average, although one student did note in his course evaluation that in the absence of a test, he could not be sure he had actually learned. But beyond this desire for confirmation of learning, the fact remains that students’ apprehensions about grades are justified. Indeed, the impact of grades is often tangible, affecting material concerns such as financial aid, scholarship, group memberships, and medical or graduate school admissions, which often pivot on GPA. Complexity of subject matter. Example of simplicity: War kills. Example of complexity: Is it worth killing a few people to free many others? Message: the extent to which your message is conveyed in a rhetorically appropriate way. Technique: the project should be unencumbered by malfunctions/misspellings and the like. Textual rationale and citation of sources. Each project also required a student to complete a structured review of another’s project, and students were graded on the quality of that review. In other words, students are not impacting other students’ grades—that responsibility should never be surrendered by faculty—rather, peer review gives students practice at critical engagement with digital texts, even as it helps them see how their own projects will be received. Moreover, such individual assignments—peer review, reading responses, reflective essays—help students exert a measure of control over their own learning in a class that includes so many collaborative efforts. Many educators and institutions of higher learning tout the value of critical thinking, and yet, by definition, critical thinking means one must challenge accepted ways of knowing. The sort of critical consciousness that such challenges can foster often brings discomfort as students must rethink ideas they have been raised with, but as noted cultural critic bell hooks contends, such anxieties should not be dodged; rather, instructors can anticipate them and provide a space in which ideas can be tested and validated or shown to be faulty (hooks 1994, 86). Indeed, this was vital to us in approaching our collaboration since we strongly felt, and continue to feel, that the critical thinking necessary to solve the complex problems of a globally networked society is distinctly at odds with authoritarian modes of education. Traditional university education based on disciplinary silos and the presumed straightforward transfer of information from instructor to student, if ever a viable approach, is certainly no longer one. This approach fails to elucidate the dynamic and systematic nature of burgeoning disciplines like global health and digital studies. New forms of digital media, used collaboratively, can help overcome these more traditional approaches. On the one hand, disciplinary sovereignty disappears within digital space that is based on integrative systems that connect and link various forms of information in multiple and continuous ways. On the other, recognizing that access to global health information is no longer confined to the scientific elite but readily available to anyone with access to the Internet requires that quality educational programs refocus, moving away from transferring facts and figures toward teaching to consolidate, evaluate, and use information effectively and responsibly. Moreover, in many ways Internet access requires far more expertise since data deluge and information overload render the expert far more valuable in terms of accessing, analyzing, assessing, and triangulating information. We can no longer teach students what to learn, we must teach them how to learn. We gratefully acknowledge the support of the USC Provost’s Office for Undergraduate Education‘s Fund for Innovative Undergraduate Education (administered by the USC Center for Excellence in Teaching), which helped make this class possible. For instance, see Elizabeth Losh’s recent book The War on Learning: Gaining Ground in the Digital University, in which Losh problematizes the different types of technologies used by universities (courseware) and by students (social media platforms), which are often somewhat oppositional, at least in their aims (e.g., security versus sharing). The authors gratefully acknowledge the utilized support received from the USC Fund for Innovative Undergraduate Teaching (FIUT). The FIUT is a USC Provostial initiative that supports novel educational initiatives by faculty who teach undergraduate courses. In 2014, the IML became a full academic division of the School of Cinematic Arts called Media Arts + Practice, with its own undergraduate major and PhD. The IML remains a research unit under the Division, which includes several interdisciplinary programs. While the lectures, discussion, and assignments were the same, written feedback and grading was done by the respective faculty member and teaching assistant. We will use the terms “new media” and “digital studies” interchangeably in this article to indicate a curriculum that focuses on a theory/practice model in which emergent forms of media are both studied and made. This is sometimes referred to as “critical making,” and used to be called “multimedia literacy,” but these terms are fluid and dynamic. We are gauging the relative success of the unit based on the quality of the student projects, as well as the students’ ability to articulate their intentions and the insights gained by completing the work. We should note that Allen Shu, the global health TA, was not interested in pursuing this publication, and was somewhat reluctant to participate fully in problematizing the pedagogy. An international doctoral student in statistical analysis, he felt this work to be too far afield from his career plans, and we honored his wishes. Jason Lipshin, one of the authors of this article, was hired as the research assistant. Jason had completed the Honors in Multimedia Scholarship program but had one final course to complete during the time he worked on the project. He has since earned a Master’s from MIT’s Comparative Media Studies program. The IML had been using the “X Wiki” for several years due to its media-friendliness, and IML programmers also built a portal around the wiki. Apple is no longer supporting this wiki software, and the IML, now the Division of Media Arts + Practice, no longer has a dedicated programmer. Even during this course, however, the Global Health class also made use of a Blackboard site because its faculty and students were familiar with the Blackboard course management system and because the wiki didn’t offer support for things like grades. We conducted the course under an expedited IRB and all students were given the option of remaining anonymous. None chose this option, and, indeed, many requested their work be online so they could show it to their friends and family. His prominent essay, “As We May Think,” has become a seminal text in many new media classes. Interestingly, the example Bush uses to make his case is Mendel’s groundbreaking work on genetics, which he notes was lost to the world for a generation because it was not accessible to those who might expand upon it. As our USC colleague and legal expert Sofia Gruskin noted, many AIDS activists were reluctant to visit the US because for many years US Customs required visitors to declare their HIV status upon entering the country. Activists justifiably saw this as a violation of privacy and one with potential ramifications for their lives upon their return home. It was the suspension of this policy that made the US a viable site for the AIDS2012 conference. Camera projects are a core component of many IML classes, and, being in the School of Cinematic Arts, we use professional-level tools and require a high degree of sophistication in filmed footage. So while we could have geared the assignment to allow students to capture video from their mobile phones, for instance, the resulting quality of the work would be uneven across student groups, or simply sub par. For a more expansive view of IML approaches to assessment, see “Speaking with Students: Profiles in Digital Pedagogy,” Kairos 2010: http://kairos.technorhetoric.net/14.2/interviews/kuhn/, which features five-minute overview videos in which students in the Honors in Multimedia Scholarship program discuss their digital theses, which are based in their major area of study. Dr. Virginia Kuhn is an Associate Professor in the Division of Media Arts + Practice in the University of Southern California’s School of Cinematic Arts. Her work centers on visual and digital rhetoric, feminist theory and algorithmic research methods. In 2005, she successfully defended one of the first born-digital dissertations in the United States, challenging archiving and copyright conventions. Committed to helping shape open source tools for scholarship, she also published the first article created in the authoring platform, Scalar titled “Filmic Texts and the Rise of the Fifth Estate,” and she serves on the editorial boards of several peer reviewed digital and print-based journals. With Vicki Callahan, she recently finished work on an edited collection, Subversive Performance and Feminist Bodies (Parlor Press, 2015). Kuhn was the 2009 recipient of the USC Provost’s award for Teaching with Technology. She directs on undergraduate Honors program, as well as a graduate certificate in Digital Media and Culture, and teaches a variety of graduate and undergraduate classes in new media, all of which marry theory and practice. Dr. Heather Wipfli is an Assistant Professor in the Department of Preventive Medicine at the USC/Keck School of Medicine and in the Department of International Relations at the USC Dana and David Dornsife College of Letters, Arts and Sciences. She is also the Associate Director of the USC Institute for Global Health. Her research focuses on global health politics and the development of innovative forms of global health governance. She has successfully led a number of large multi-country research and capacity building projects focused on global health and policy, including a study of secondhand smoke in homes in over 30 countries. She also contributes to improving the capacity of individuals and organizations to address global health issues through the development and delivery of innovative onsite and online curriculum, including having developed numerous undergraduate and graduate global health courses that experiment with new modes of learner-centered learning, including the use of technology, interactive play, and professional immersion. Dr. Wipfli has published work on policy diffusion, capacity building in developing countries, globalization and health, and health security. Her book on global tobacco control was published by Johns Hopkins University Press in 2015. Jason Lipshin is a user experience design researcher for TomTom in Amsterdam. He focuses on the exploratory stages of product development, working on next generation navigation devices and fitness-oriented wearable computing. Before TomTom, Jason worked as an interaction design intern for Disney Interactive Group in Tokyo, Japan. He helped create wireframes and concepts for apps that will be soon be released to the Japanese market. In 2014, Jason received his M.S. from MIT’s Comparative Media Studies program, where he wrote his thesis on ubiquitous computing. He was also a researcher for both the MIT Mobile Experience Lab and the MIT Imagination, Computation, and Expression Lab, where he wrote publications and developed prototypes devoted to these (and other) topics. Jason graduated from USC in 2011. In his time there, he worked extensively with the Institute for Multimedia Literacy (now the Division of Media Arts + Practice). Susana Ruiz is an artist and scholar whose teaching and research are broadly concerned with how the intersection of art practice, game design, computation, and storytelling can enable emergent forms of social justice, aesthetics, and learning. Much of Ruiz’s work takes place via the studio she co-founded, Take Action Games (TAG), which has an evolving portfolio of “serious”, documentary, and “art” game design, participatory culture, and transmedia storytelling. TAG’s accolades include the Games For Change Audience Award, the Adobe MAX Award for Social Responsibility, Honoree status in the Webby Award Activism Category, and the Academy of Television Arts & Sciences’ prestigious Governors Award as part of the mtvU Sudan campaign. Ruiz is an Assistant Professor in the Department of Film and Digital Media at the University of California, Santa Cruz. She was a member of the first cohort in the Interactive Media and Games MFA program at USC’s School of Cinematic Arts and then a member of the second cohort in its Ph.D. program in Media Arts + Practice. She was a USC Provost’s Fellow and recipient of the University of Southern California’s Ph.D. Achievement Award, the highest honor bestowed on doctoral candidates at USC. Featured throughout the video are reflections upon materiality from scholars working within various fields, but who all impact studies in rhetoric and composition—Katie and Nathaniel’s disciplinary home. Many of these thinkers and the lines of thought within which they work treat materiality as having rhetorical efficacy, and so too does this project credit material spaces and their aggregate parts as rhetorically impacting and shaping the human interactions that occur within and among them. Katie: In the early days of writing my dissertation I established a standing date with a 12 oz. coffee and a croissant. Every Friday morning I and the materials of my dissertation made our way to a local spot, Blueprint Coffee, to spend the morning drafting – word by word, sentence by sentence, section by section, and, eventually, chapter by chapter – the tallest project of my graduate career. Nathaniel: Writers are nomads in search of a place, and a coffee shop is an oasis for such weary travelers: the right mix of hustle and bustle, sound and silence, caffeine and calorie. A place to be wired and wireless. A medium for a medium. Katie: It was the ambience of this architecturally-themed spot that invited me to return week after week. With its drafting tables and stools, crisp white subway tiles, and smooth stainless steel counter tops, the space is a cluttered mind’s sweet retreat into organization of the most satisfying kind. What’s more, the space and its curators exude a palpable hospitality, a concept which is, coincidentally, the support beam upon which my dissertation project rests. Nathaniel: Blueprint speaks to and through Katie’s work. It speaks to me too as Katie’s mentor, and models what I have come to recognize as my approach to mentoring. The performance of coffee resonates with the arrangement of the location. There is casual fastidiousness to the place. There is an earnestness in the effort to make coffee visible as an activity – like a building once built that still celebrates it blueprints. The operation of making coffee – cupping, roasting, brewing, and experiments across all three–is performed in public. And so my mentoring amounts to discussing blueprints, my own as well as Katie’s. My own struggles with research and writing. What I’m working on, how I am responding to reviews and other feedback. Whatever advice I brew, its brewing is a part of its delivery. Katie: There is always, first, the offer of a glass of water upon placing your coffee order. Then there is the request of your name which will in turn not be written on a paper cup and exclaimed into the crowd, but spoke with a caring tone as you’re served tableside, as if in the home of a friend. 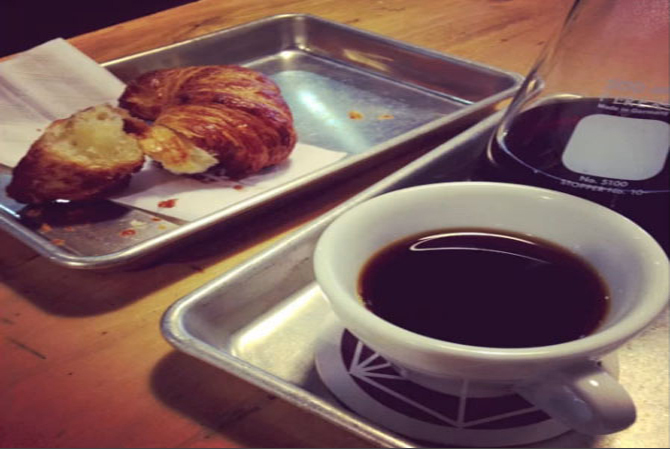 As unique to this place as its address, is its hospitable treatment of the coffee beans – ground finely with a special grinder, brewed by hand with water heated to a precise and bean-friendly temperature. At a certain point it occurred to me: this space and its materials are more than places listed in my weekly calendar but co-collaborators in the project planning and writing that emerges there. I began documenting my work in this space with Instagram pictures; pictures to which my advisor would often respond with words of encouragement. And eventually it began to happen that this space became a blueprint for our mentoring relationship, which always had been but was slowly seeing refinement as one marked first and foremost by collaboration. Nathaniel: Writers are nomads in search of a medium. Place is a medium, and a medium can be a place. A medium makes a place by pulling together disparate elements together. Place is a mediated aggregate of actors and forces. Place is a collaborator. Blueprint opens itself up to those working with/in it. It is friendly, forthcoming. Place is a mentor. Blueprint is a place for unique forms of engagement and exchange. Places can work with us. They can also, of course, work against us. Because a place is not some inert container it can resist as much as rewards. Place, like any collaborator, can be unreliable. Colleagues must be chosen wisely. Sometimes an oasis is a mirage. Katie: With our explicit attention to the places in time that we chose to share, we begin to notice not only all the places in which we formally met, but also where informal collaboration occurred all the time – in the margins of what we were reading, in Instagram photos and comments, in the line-by-line notes made upon chapters under review, and in written and verbal responses to those remarks when we met to review chapters, and in our respective working spaces. Blueprint periodically stabilized this complex collection of collaborations, drawing us in with its unique, ambient qualities. With those qualities, we continually built and maintained a place for mentoring as collaborative. The many and diverse occasions upon which our thinking became merged eventually became habitual. The spaces of our collaboration built also the shape of our mentoring relationship outside of those spaces. Katie Zabrowski is a doctoral candidate with an emphasis in rhetoric and composition in the English department at Saint Louis University. Her current research articulates hospitality as the ethic upon which rhetoric operates. Engaging hospitality as both material and discursive, she works through new materialism’s implications for rhetoric and writing to propose ways in which pedagogies might be mobilized hospitably in rhetoric and composition classrooms. Her work has appeared in Kairos andenculturation. She tweets at@katethegrater. Nathaniel A. Rivers is an Associate Professor of English at Saint Louis University. His current research addresses new materialism’s impact on public rhetorics such as environmentalism and urban design. Together with Paul Lynch, he edited Thinking with Bruno Latour in Rhetoric and Composition (SIUP 2015), which explores the impact of Bruno Latour on rhetorical theory, composition pedagogy, and research methodologies across both. His work has appeared in journals such as College Composition and Communication, Kairos,Technical Communication Quarterly, enculturation,Journal of Technical Writing and Communication, and Rhetoric Review. He tweets at@sophist_monster. This essay describes an experiment with critical simulation—the pedagogical application of simulation to foster critical thinking. I theorize this technique in comparison to standard simulation pedagogies and point out some examples of existing simulations and games that achieve similar results. In order to model critical simulation pedagogy for post-secondary education, I describe one instance of this technique that occurred in an elective course on utopian literature I taught at the Borough of Manhattan Community College of The City University of New York, a bustling community college in downtown Manhattan with a majority African-American and Hispanic working-class student population. In the course, I assigned students to work in groups to design a multimedia brochure for an intentional community (i.e., a planned residential community that is a social experiment in utopian living). During the semester, students worked in groups to draft pieces of the project in response to in-class “challenge” assignments that asked them to devise solutions to social, political, economic, and environmental problems. They then used this material to assemble brochures, which they presented to the class at the end of the semester. Throughout this process, students engaged course texts both as resources for invention and as artifacts for critical evaluation. My hypothesis was that by turning students into active producers of utopia via a critical simulation they would be in a better position to meet course objectives, namely to learn the conventions of utopian discourse and to adopt a critical utopian frame for evaluating utopian texts and real-world phenomena. I evaluated my hypothesis by interrogating the finished products and analyzing debriefing surveys conducted at the end of the semester. The results suggest critical simulation is a promising technique that complements traditional forms of instruction and has much to offer instructors interested in promoting critical thinking, regardless of discipline. They also raise some interesting questions about the relationship between pedagogy, critical thinking, and social change. By modeling reality, simulations offer learners the ability to “tie the words and structures” of the new domains they are learning to “experiences they have had,” thereby consolidating and deepening their understanding of the new domain by embodying the new knowledge in lived experience. Simulations have a long history of pedagogical application. The earliest educational uses of simulations focused on military training. These include the Chinese war game “Weihai” developed around 3000 BCE (which later became the Japanese game “Go”) and the sixth-century CE Indian war game “Chaturanga” (a precursor to Chess) (Gilliom 1974, 265). Modern military simulations emerged in 1798 with the introduction of large-scale battle simulations conducted by the Prussian army (Gilliom 1974, 265-66). In the twentieth-century, the U.S. military became a trendsetter in the field, and its wide-scale adoption of simulation and gaming technologies for training and recruitment facilitated the entry of these techniques into the corporate and educational sectors (Mead 2013). Simulations began to garner significant support outside of the U.S. military in the 1950s. In 1956, members of the American Management Association traveled to the Naval War College and were so impressed by the Navy’s use of training simulations that they were inspired to produce the first widely used management game for corporate training. Boeing and several other companies responded by launching their own training simulations (Gilliom 1974, 266). By the 1960s, growing research and speculation on the benefits of educational simulations drew the attention of elementary and secondary school educators and administrators, who subsequently began to embrace the technique, first by adopting commercial simulations, later by designing their own (Gilliom 1974, 266-67). Then, by the early 1970s, post-secondary education began to follow suit with the adoption of simulations in business, political science, international relations, sociology, psychology, foreign language, and education programs (Gilliom 1974, 270-71). Simulations and games also gained traction among writing and literature instructors in post-secondary education. Since at least the early 1970s, post-secondary teachers of English composition and literature have experimented with the use of simulations and games to optimize literacy skills and deepen understanding of course texts (Brewbaker 1972, 105). Lynn Q. Troyka produced the first full-length study of the topic with her doctoral dissertation, “A Study of the Effect of Simulation-Gaming on Expository Prose Competence of College Remedial English Composition Students” (New York University 1973), later published with co-author Jerold Nudelman as Taking Action: Writing, Reading, Speaking, and Listening through Simulation-Games (1975). The volume documents six simulations for the English classroom and provides materials to reproduce them. Troyka and Nudelman’s book has been followed by a significant number of studies that focus on the documentation, theorization, or evaluation of simulation- and game-based approaches to the teaching of writing and literature (Sloan 1978; Kroll 1986; McCann 1996; Saliés 2002, 2007; Nash 2007; Kovalik and Kovalik 2007; Colby and Colby 2008; Alexander 2009; Krause 2010; Colby, Johnson, and Colby 2013). These studies demonstrate the rich history and potential of simulations for the teaching of writing and literature specifically, and signal their value for post-secondary education generally. In each instance discussed above—the military, corporate America, and (higher) education—simulations have been embraced for their uncanny ability to engage learners and situate meaning in ways that optimize the acquisition of a particular domain, be it military tactics, business practices, or discursive fields. These cases share a standard mode of simulation that I call simulation for social reproduction, in which the goal is to impart a certain specialized body of knowledge, methods, or terminology in order to assimilate the learner to an existing domain and thereby reproduce that domain. By participating in domain-based simulations, the learner comes to adopt what David Shaffer calls the epistemic frame of that domain—“the conventions of participation that individuals internalize when they become acculturated [to a domain]” (Shaffer 2005, n.p.). Simulation for social reproduction achieves its learning objectives when the learner has assimilated to the ways of thinking (i.e., the epistemic frame) intrinsic to the domain that is being modeled. 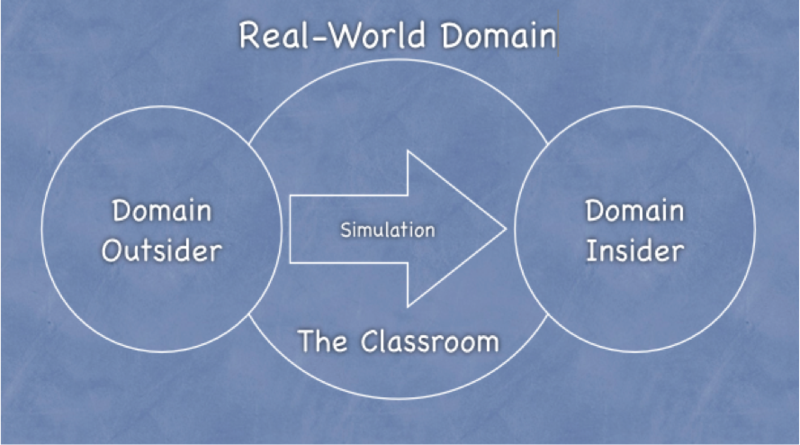 In the standard simulation for social reproduction, then, simulation is used to bridge the classroom “sandbox” and the real-world domain (see Figure 1). By situating meaning in the classroom, the simulation facilitates transition from domain “outsider” to “insider,” thereby assimilating the learner to an existing domain and the social order to which it belongs. Because critical thinking seeks not only to understand but to evaluate domains, a new method of simulation must be devised that poses the subject matter of the new domain not as a body of knowledge to be assimilated and mastered, but as a problem to be analyzed and solved. In this way, the learner can adopt “habits of thought” that make it possible for one to “understand the deep meaning” of the new domain and make critical evaluations. This new kind of simulation, what I call critical simulation, is one approach to practicing critical gaming pedagogy, a model I theorized elsewhere as a technique for using simulation and gaming “to promote critical thinking about hegemonic ideas or institutions rather than to propagate them” (Crocco 2011, 29). Essentially, conventional uses of simulation and gaming for education, which are often promoted as alternatives to the traditional factory model of education, in fact, upgrade this model for a twenty-first century high-tech economy—effectively delivering the factory model 2.0 (Crocco 2011, 29). This complicity with the traditional aims of schooling is evident in the distinction between standard and critical simulation. Whereas the goal of standard simulation is to use simplified models of reality to assimilate the learner as efficiently and effectively as possible into the domain being simulated, critical simulation resists the ideological closure of assimilation by presenting models of reality that defamiliarize the domain in question and pose it as a problem to be investigated and resolved. 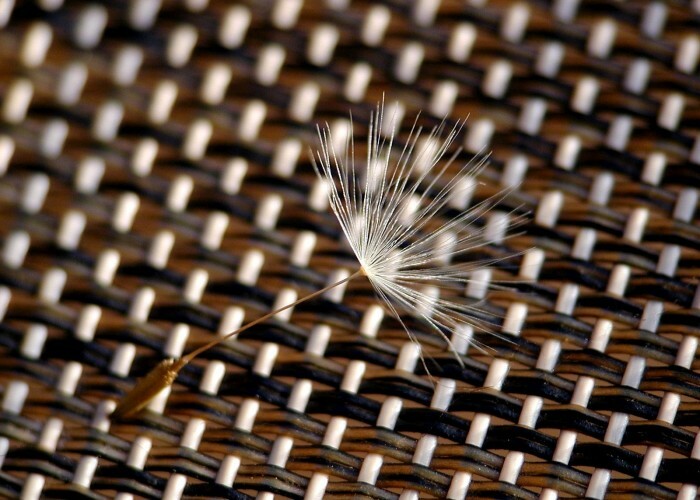 If successful, the critical simulation will produce cognitive dissonance between one’s pre-conceived notions about a domain and the new experiences generated by the simulation; this opens up a space for critical reflection and analysis. Consequently, instead of moving the learner from a domain outsider to an insider, the critical simulation moves the learner from an uncritical point-of-view to a critical point-of-view about that domain (see Figure 2). Figure 2. A critical simulation. While this theorization of critical simulation is new, there are many instances of simulations and games in secondary and post-secondary education that operate like critical simulations. The list of applicable simulations and games includes those designed to challenge economic policies by raising awareness about the effects of social inequality (Schulzke 2013; Norris 2013; Ansoms and Greenen 2012; Fisher 2012; Crocco 2011; Dundes and Harlow 2005; Thatcher and Robinson 1990), address the lack of civic engagement (Bernstein and Meizlish 2003; Raphael et al. 2010) and empathy (Bachen, Hernández-Ramos, and Raphael 2012; Barak et al. 1987), explore the problem of climate change (Sterman et al. 2014; Lee et al. 2013), question urban planning models in light of sustainability concerns (Gaber 2007; Torres and Macedo 2000), re-enact and problematize history (McCall 2011; see also the Barnard College Reacting to the Past series), and teach critical methods for approaching the social sciences (Simpson and Elias 2011; Martin 1979). In seeking to design so-called “games for change,” activists, NGOs, and state agencies have also developed critical simulations. These games and simulations situate the player in contexts where adversity or moral quandaries lead to a re-examination of held beliefs or prevailing logics, thereby moving the player toward a new, more critical understanding of the subject matter. For instance, in the video game 3rd World Farmer, players simulate the experience of a farmer in a developing nation in order to unsettle preconceptions about the etiology of third-world poverty and make explicit its relation to centers of power in the first world. The McDonald’s Video Game puts players at the helm of this transnational corporation and requires them to resolve moral quandaries in which they must weigh profit margins against workers rights, consumer health, and environmental protection. By factoring in these externalized costs of doing business, players can challenge the conventional business ethics and decisions that typical management simulations tend to normalize. These examples demonstrate how critical simulations situate learning within models of reality in ways that problematize rather than preserve established domains or hegemonic beliefs. Why Use Critical Simulation for Teaching Utopia? If utopia can be described as a “space of hope” that inspires “social dreaming” (Sargent 2010, 5) and nourishes “the desire for a better way of being” (Levitas 1990, 198), Ricoeur adds that it is also, and as importantly, a “space of criticism” that provides a critical vantage on ideology. This parallelism between critical thinking and utopia raises two important conclusions about teaching utopia with simulation. For one thing, since utopia is fundamentally concerned with teaching critical habits of mind—both about other domains and its own—it cannot be paired with standard simulations, which mainly achieve the goal of training and assimilation rather than critical reflection and analysis. Secondly, because the utopian frame—the knowledge, methods, and terminology that comprise utopian discourse—is consonant with critical habits of mind, the experience of deploying critical simulation in a utopian classroom will, paradoxically, have the added effect of achieving the rather orthodox goal of the standard simulation, i.e., specialized training in an epistemic frame, in this case the utopian frame. In addition to posing critiques of what is, critical simulations and utopias also share in common the desire to imagine alternative configurations for what could be. Ernst Bloch captures this dialectic between critique and creativity by describing utopian thought as “anticipatory consciousness,” the “Not-Yet-Conscious” that “wants to look far into the distance … in order to penetrate the darkness so near” (Bloch 1986, 1:11-12). Scholars have attempted to articulate a “utopian pedagogy” to promote this critical/creative consciousness, noting that whereas the purpose of education is typically “to produce social subjects for the perpetuation of the neoliberal order,” the goal of utopian pedagogy should be “to foster experiments in thinking and action that lead us away from that order” and “point us towards…‘the coming communities’” (Coté, Day, and De Peuter 2007, 14-15, italics in the original). Different strategies have been proposed to achieve the goals of utopian pedagogy. In the tradition of critical pedagogy, for instance, a high value is placed on the relations of power in the classroom. By replacing the one-way “banking model” of education (in which information is “deposited” into students’ heads and “withdrawn” for tests) with a democratic classroom in which power is decentered, authority is shared, and decisions about curriculum are negotiated (Freire 2002; Shor 1996), critical pedagogy models utopia in the present. On the other hand, even if such a democratic space could be constructed within an otherwise hierarchical educational institution the result may be what Samuel Bowles and Herbert Gintis call a miniutopia—an ephemeral classroom utopia that leaves students “lacking a political understanding of their predicament” (Bowles and Gintis 1976, 255). Consequently, Nichole Stanford suggests that, by neglecting to teach students how to apply the democratic processes of the classroom to real-life circumstances, miniutopian pedagogies “can wind up reifying existing social conditions in the same way that traditional pedagogy does,” either by promoting escapism or leaving students to blame themselves for their inability to assimilate successfully (Stanford 2012, 7-8). What is missing from most utopian models, including critical pedagogy, is the simulation of change or transition from the old social structure to the new. Alternatively, Stanford proposes using the classroom as a “safe house” in which students get to practice how to critique, negotiate, and change society by problem-posing real-world conflicts, beginning with organizing to negotiate changes with the representative authority, the teacher (Stanford 2012, 10). 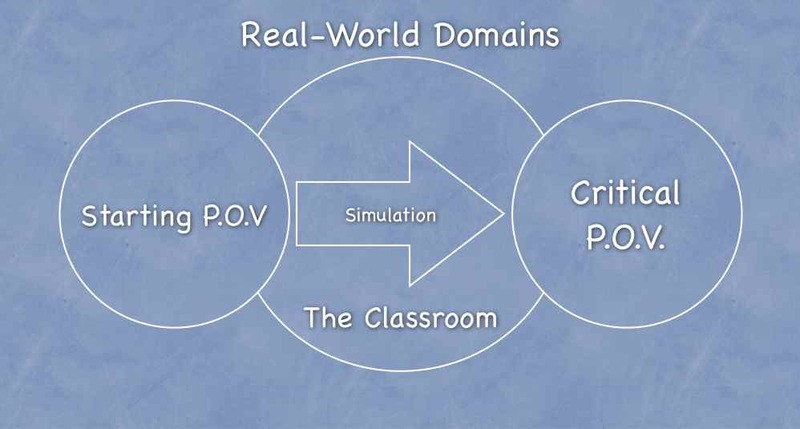 Critical simulation combines elements from both of these approaches: it imagines utopia in the present by decentering the classroom with interactive experiences in which students learn by making decisions and evaluating outcomes, and these experiences involve practicing how to negotiate real-world problems and devise alternatives to the status quo. The difference between problem-posing in social reproduction simulation and critical simulation lies in what is allowed to be a problem: like the safe house model that invites students to change their real circumstances, critical simulation poses current power structures as the problem. Finally, critical simulations and utopia resemble each other because utopia is itself a kind of critical simulation. In “How to Play Utopia,” Michael Holquist compares chess to utopia, suggesting that “the comparison of chess to battle is roughly parallel to the relationship which obtains between utopia and society” (Holquist 1968, 107). Both, he argues, are simulations that present simplified models of reality—the battlefield and the polis—in which players have the opportunity to replay history and speculate different outcomes. Where the chess player may re-enact historical battles using specialized chess sets carved to resemble particular armies and eras, the player of utopia replays social evolution to produce different kinds of civilizations. In this process, “The irreversibility of history is stemmed, and outcomes determined by the contingency of actual experience, can, in utopia, be reversed in the freedom of the utopist’s imagination… Utopia is play with ideas” (Holquist 1968, 119). Viewed in this manner as a kind of grand simulation, an elaborate “what if” in which authors “play with ideas” in order to imagine different social outcomes, utopias operate like critical simulations: both involve critical thinking, decision-making, and speculation about possible futures. If utopia is itself an exercise in critical simulation, one in which authors design alternative futures that critique and inspire, what better way for students to learn about utopia than by imitating this process? Students in my course would become designers of utopia, and in doing so they would practice the critical habits of mind intrinsic to the utopian frame and situate their understanding of utopian texts within an embodied experience of utopian design. While a design-based approach to teaching language and literature is not new—it was famously promulgated by the New London Group (of which James Gee was a member) as a pedagogy for multiliteracy (Cazden et al. 1996), this application in a utopian literature course provides a case study for how such a method might work to situate meaning using the techniques of critical simulation. Figure 3. A critical simulation for a utopian literature course. The critical simulation I designed took the form of a semester-long cooperative / competitive game in which five teams of students designed intentional communities—actually existing social experiments in utopian living. Students developed the designs for their communities through a semester-long iterative process that involved engaging with course texts to prepare solutions to a list of contemporary social problems. They assembled this work into a multimedia digital brochure for an intentional community that each team presented to the class at the end of the semester, which provided a gratifying sense of closure to the course. The classroom thus became a sandbox for utopia: students simulated the experience of designing utopia, and this experience helped them move from using an uncritical initial frame to a critical utopian frame while simultaneously moving them away from being outsiders to becoming insiders in the discourse by providing opportunities to engage course texts and concepts (see Figure 3). This semester-long process of utopian design was stoked by periodic “challenges”—in-class assignments that followed discussions of course texts in which the class collectively problem-posed some aspect of society criticized in that week’s reading material, and then worked in teams to develop innovative solutions. The challenge themes isolated different components of the conceptual work required to produce an intentional community: (1) the distribution of work and resources; (2) gender roles; (3) education and healthcare; (4) spirituality and well being; (5) government, freedom, and international relations; (6) consumption and waste management; (7) energy and environment; and (8) urban and suburban planning. In the spirit of Ernst Bloch’s conception of the “not yet,” each challenge began with a critique of what is and followed with a discussion of what could or should be. The course texts provided useful resources for this process by modeling utopian critiques and alternatives, but also by furnishing raw material for the students’ designs. The texts included selections from Plato’s Republic, Thomas More’s Utopia, Henry David Thoreau’s Walden, Edward Bellamy’s Looking Backward, Charlotte Perkins Gilman’s Herland, George Orwell’s 1984, Aldous Huxley’s Brave New World, Harlan Ellison’s “‘Repent Harlequin,’ Said the Ticktockman,” Ernest Callenbach’s Ecotopia, and Octavia Butler’s Parable of the Sower. I also assigned students to read about intentional communities past and present. They read about Charles Fourier’s phalanxes, Robert Owen’s cooperatives, Icarian communes, Brook Farm, the Oneida Community, Shaker villages, and contemporary intentional communities. To round out the course material, students examined urban and suburban planning blueprints, such as Ebenezer Howard’s “Garden City of Tomorrow,” and viewed clips from several documentary films that addressed social and environmental concerns. While the design process constituted a single, semester-long critical simulation, each individual challenge was the equivalent of a mini-critical simulation that targeted a specific issue in order to provoke awareness and inspire creative alternatives. Through this process, the domains under consideration—e.g., economics, ecology, urban and suburban planning, etc.—were reframed as problems to be solved rather than as normative discourses to be learned and internalized. While the course texts initially served as touchstones for utopian critique and storehouses of fresh ideas, as students became empowered utopian producers in their own right they began to question the texts and treat them as much as codifications of ideology as the domains they scrutinized. At the conclusion of each challenge round, the teams would present their work, provide constructive feedback for revision, and select the most innovative design, after which I would award nominal prizes. They recorded their work on a group blog, which simultaneously functioned as a drafting site for the final digital brochure, a forum for instructor feedback, and a communication hub for the team. This multi-stage, design-based critical simulation enhanced rather than displaced the more traditional pedagogical methods used in the course, such as reading, writing, and discussion. It also integrated the major learning outcomes for the course—reading comprehension, critical analysis, and intellectual production—into a single, unified process. The digital brochures assembled from the raw material of the challenge assignments were required to have four parts: (a) a common mission statement outlining the history, goals and purpose of the community; (b) a description of a typical day in the life of the community; (c) a visual blueprint for a town, village, or city in the community; and, since it was a brochure after all, (d) information about how to join the community. The final products took the form of colorful slideshows, PDFs, and websites. The components for these brochures were copied in part from the Fellowship for Intentional Community website, a promotional catalog of ongoing experiments in “practical” utopias that students were asked to peruse at one point in the semester. Since the website included mission statements, photographs, and contact information for each listing, we used it as a model for the students’ digital brochures. While the intentional communities website provided a handy model for the students’ projects, it was not my only or even primary motivation for having students design their final projects as digital brochures. This decision hinged on other factors, as well. I chose mass media and marketing genres for this assignment because the goal of “selling” utopia to an audience and recruiting utopians resonates with the persuasive thrust of utopian literature. From Plato’s Republic to More’s Utopia to Callenbach’s Ecotopia and beyond, one finds a common pattern in which the author, through the intermediation of critical or skeptical narrators and interlocutors, attempts to persuade the reader that a better world is possible. This does not necessarily imply that the author has (or even wants) a blueprint for utopia, but it does make persuasion an explicit part of the bargain. Thus, in the same way that a brochure is rhetorically intentioned to sell a product, utopian literature is often rhetorically intentioned to sell an idea—about how one should live or not live. Of course, adopting the format of the brochure—a product so keyed to capitalist commodification and consumerism—for utopian discourse—which is decidedly anti-capitalist—may seem paradoxical. But a crucial part of critical simulation is challenging students to imagine ways to transition from one social system to another; in this scenario, they appropriate existing capitalist tools to launch anti-capitalist structures. Finally, I decided to use a digital format for the brochures because it offered the most versatile tools for taking the different media the students had drafted in the challenge assignments and assembling them into a single document. This material included text, images from the web, sound bites, video clips, photographs, and even hand drawings (one challenge required students to draw a resource map for their community). The final product was a virtual bricolage of a semester’s worth of crafting in the service of utopian social dreaming. The students presented five brochures for intentional communities at the end of the semester: Halo, a tourism and export-based island resort; Vacileeco Palati, a high-tech new-Atlantean commune; Northern Green, a secessionist eco-commune; Guavaland, an agrarian autarky with sprinkles of futuristic technology; and Phoenix, a back-to-nature libertarian community of individual producers. These unique designs display a wealth of critical engagement with contemporary issues and course texts, as well as a keen sense of adaptation and invention. While there is some interesting overlap between the designs, there are also many key differences. In the paragraphs that follow, I provide an overview of each intentional community using snippets of text and images from the brochures. I also highlight where and how the projects engage with course material and problem-pose aspects of contemporary society, thereby meeting my objectives for this application of critical simulation. Figure 4. Halo cover image. Figure 5. A map of Halo. 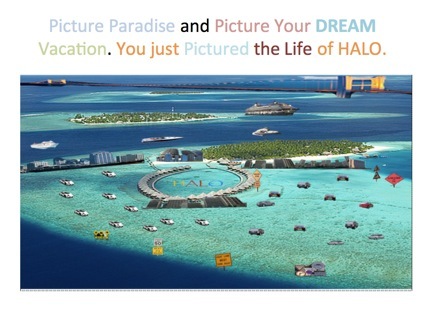 Halo’s design is clearly influenced by the meme of an island utopia first established by More’s seminal text. But its emphasis on leisure—both in terms of its clever marketing scheme and its economy—draws upon different sources. In this respect, Halo finds inspiration in Thoreau’s Walden and Ellison’s “‘Repent Harlequin’,” texts that challenge the self-destructive effects of undue busyness and mindless consumerism. In this regard, Halo’s rejection of the stressful, multi-tasking, productivity-obsessed, and acquisitive lifestyle of Western consumer society constitutes its most poignant social critique. Yet, it achieves this critical distance not by copying the escapist or subversive logics of Thoreau and Ellison’s texts, respectively, but by embracing and transmogrifying the commodity logic of the globalized leisure economy. Halo is only tenable because it complies with the circuit of work and leisure that sustains the dizzying rhythm of life in modern society. Yet, it tempers its participation in this status-quo macro-economy with a micro-economy that stresses communal forms of decision-making and equitable resource distribution. Its scheme is based on the socialization of that which already exists—namely the tourist-based export economies shaped by trans-national capital and International Monetary Fund policies to service weary laborers from the more affluent nations. Figure 6. A diagram of Vacileeco Palati. Vacileeco Palati is an interesting hybrid of concepts from several course texts, and also draws from Francis Bacon’s New Atlantis, which was not a course text. As a floating island, Vacileeco Palati is an interesting spin on More’s Utopus and Bacon’s Bensalem. It shares with More’s Utopia, Bacon’s New Atlantis, and Plato’s Republic a preference for knowledge and learning. The moneyless, communist economy constitutes a sharp break from modern capitalist societies and coheres with the rejection of money and private property in More, Plato, and Bellamy. In terms of the political system, the practice of rewarding hard work with leadership roles resembles Bellamy’s plan for an “industrial army” in Looking Backward, while the idea of the “Board of the Wise” recalls Plato’s “guardians” and Bacon’s “Salomon’s House.” The rotation of the workweek between urban and agricultural labor is an interesting adaptation of More’s seasonal work rotations. Meanwhile, the ringed layout of the city bears more than a passing resemblance to Howard’s “Garden City of Tomorrow.” Finally, the threatening backdrop of overpopulation and resource depletion recalls the warnings of Callenbach’s Ecotopia and Butler’s Parable of the Sower. Overall, this resourceful, hybrid design demonstrates a critical rejection of the individualism, acquisitiveness, and resource-depleting tendencies of capitalist society. Its alternative, though inspired by course texts, borrows and innovates what is desirable, rejects what is not. Figure 7. Northern Green cover page. 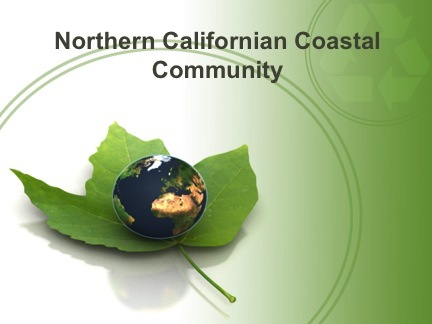 Northern Californian Coastal Community, Northern Green for short, is a sovereign country founded in the year 2025 in a part of California that seceded from the United States. The mission of this eco-commune is to achieve an “ecologically sustainable, off-grid powered existence.” This central pre-occupation with sustainability is thematically expressed in the layout and imagery of its brochure (see Figure 7). To realize its mission, the Greens limit their population to 200,000, rely on renewable energy, and grow everything they need. The Greens are communitarian and democratic. Everyone is expected to work, resources are owned in common, and wealth is equally distributed using a credit card system. The line of influence from a single course text is perhaps most pronounced with Northern Green. The placement, history, “green” ethos, and marketing aesthetic suggest a community that is clearly inspired by Callenbach’s Ecotopia and its critique of an ecologically and psychologically unsustainable industrial society. Ecotopia is similarly located on the western coast of the former United States, having seceded from the Union over various environmental and political concerns, and professing an equally “green” sensibility. Both utopias reject industrialism, consumerism, alienating urban metropolises, and the concept of infinite growth that propels capitalist societies. And yet, there are also significant differences between them. Northern Green rejects key elements of Ecotopia, such as its emphasis on decentralized, small crafts production, and the continuation of racial segregation. Rather than slavishly imitate Ecotopia, Northern Green turns to other course texts for inspiration. The equal credit system recalls the credit system from Looking Backward, while the idea of garden cities references Howard’s early designs for suburbia. Figure 8. 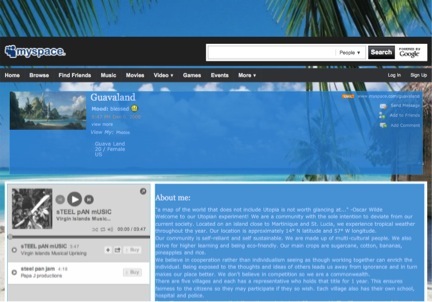 Guavaland’s Myspace page. Figure 9. 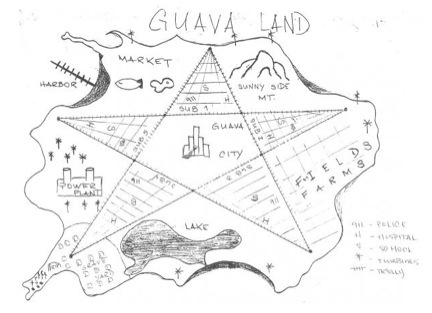 A map of Guavaland. Guavaland is similar to Halo in its rejection of the “fast-paced life” that plagues many modern industrial and post-industrial societies. However, it rejects becoming inscribed within the globalized economics of the commodified leisure industry that Halo occupies. It embraces, instead, an agrarian economy that emphasizes self-sufficiency, natural living, and renewable resources. In these respects, Guavaland bears more than a passing resemblance to Ecotopia. But it also borrows from other sources. For instance, the commonwealth system and communitarian values evoke More’s Utopia, while the pentagram layout of its suburban villages is a novel interpretation of Howard’s garden city design. The science-fiction feel and look of Guava City seems misplaced in this communitarian eco-village. But it also promises that nature and technology can successfully co-exist. Phoenix’s fiery phoenix imagery says it all (see Figure 10). It is a community of survivors intent on rebuilding human civilization after the predations of modern industrial society unleashed a tsunami of global climate change, famine, pandemic, and war. The brochure features a quote from Jean-Jacques Rousseau’s Emile (1762) that neatly sums up Phoenix’s philosophy: “It is in man’s heart that the life of nature’s spectacle exists; to see it one must feel it.” The quote encapsulates Phoenix’s rejection of modern industrial society in favor of a back-to-nature approach to life that favors sustainability and personal freedom. 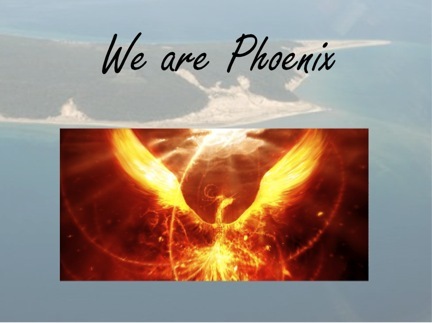 The Phoenixans are a libertarian society with communal traditions and a commitment to lo-tech (there is no electricity), environmentally friendly technologies. Each citizen is an individual freeholder who pursues a trade and barters for other goods and services. The society is governed by a council of elders and all citizens are expected to obey a central constitution called the “Code of Conduct,” which includes laws prohibiting violence and intolerance, regulations for “green roofs” (see Figure 11), protections for the right to free education and healthcare, and the requirement that each citizen donate 20 percent of their labor to the community. Figure 11. Green roofs are mandatory for all Phoenixian domiciles. 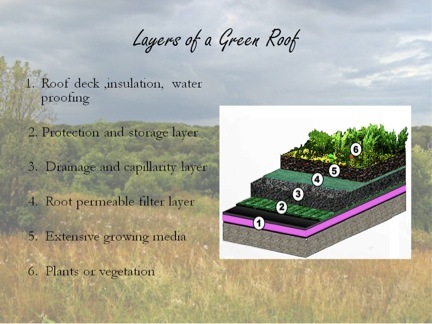 This design is intended to provide several benefits: it extends the lifespan of the roof, provides food, purifies the air, and increases biodiversity. Phoenix differs from the other intentional communities in the depth of its origin narrative. After the collapse of civilization into bloodthirsty bands of nomads and scavengers, an oracle-like woman named Themis brought together a rag-tag group of survivors and resettled what is now North Manitou Island in Lake Michigan (now transformed by global warming into a temperate environment), renaming it “Avani” (Sanskrit for “Earth”). In 2059, they founded the community of Phoenix to symbolize the fact that they were “rising from the ashes of their predecessors.” Three generations later, Phoenix numbers 500 members and growing. Phoenix’s design incorporates elements from several course texts. The emphasis on green technologies and barter economies suggests a clear line of influence from Callenbach’s Ecotopia, while the council of elders is reminiscent of the respect accorded to elders in Gilman’s Herland. Yet, the most striking similarity is with Butler’s Parable of the Sower. The Parable is similarly a post-apocalyptic tale about the trials and tribulations of a rag-tag bunch of survivors who must brave a “Mad Max”-like landscape to arrive at a safe haven where they can start over. The oracular Themis, whose name is taken from the Greek goddess of law and order valued above all for her good counsel, is an allusion to Butler’s spunky prophet-like protagonist, Lauren Olamina, who leads these survivors and inspires them with her new religion, Earthseed. 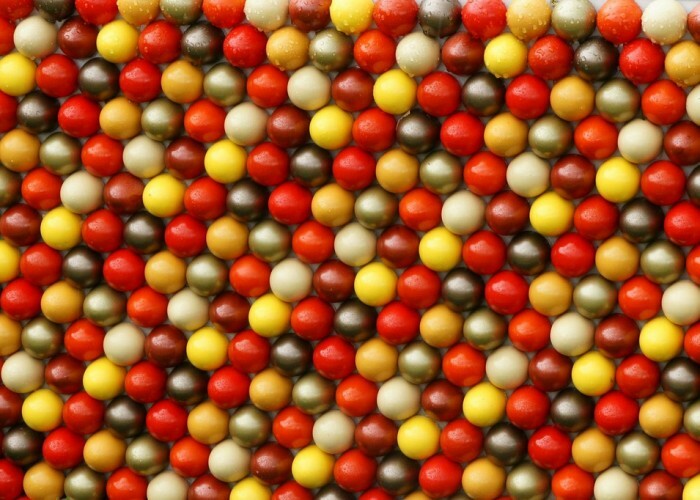 In the end, they found a community, Acorn, in the Parable of the Sower, which promises to be the seed of a new society. Similarly, the back-to-nature vision of the oracle Themis attracts followers who eventually come together to plant the seed of a new society, Phoenix. Both narratives are examples of what Lyman Tower Sargent has called critical dystopia, a vision that “holds out hope that the dystopia can be overcome and replaced with a eutopia” (Sargent 2001, 222). Phoenix thus combines an apocalyptic vision that critiques what is wrong with contemporary society—from our overreliance on fossil fuels to our exploitative relationships with the Earth and each other—while pointing the way to a compassionate alternative. I decided to follow up the students’ final presentations with an exit survey to have them debrief about their experience with the critical simulation. I asked the students: Did it help you to improve your understanding of course material? Did your idea of utopia change after taking this course? Not everyone completed the survey, but the responses I did receive suggest the critical simulation was a successful “fourth leg” to the more traditional pedagogical elements of literature courses, namely reading, writing, and discussion, which were also utilized by this course. By putting ourselves as planners of our utopia and facing the challenges posed by the professor, I was able to change my mindset into actually thinking about how I would change the world and then this was contrasted by the authors’ ideas on how to change the world. It is definitely a key part of the class, and the discussions within my group allowed me to better understand everything and to get different views. The group project was very effective for helping to understand what we were supposed to get out of this course. The reason why it was so effective was due to the fact that we had to put ourselves in the realm that these authors were to attain our understanding of how complicated and visionary it is to have to design a utopia. The comments highlight the benefits of situated learning that all simulations provide. By putting themselves “in the realm” of the authors they were reading, the critical simulation afforded them a better understanding of the conventions and complexities of utopian thought and production. The second question—whether the course altered students’ visions of utopia—really got to the core of what I hoped to accomplish with the critical simulation. If one goal of utopia is “the education of desire” (Thompson 1977, 791), then by measuring how much a student’s thinking about utopia had changed from his or her initial conception of it at the beginning of the semester, I would be able to appraise how well the critical simulation had provoked a critical re-examination of the domains (e.g., government, economy, ecology, etc.) and themes (e.g., justice, equality, harmony, etc.) that are the central pre-occupation of utopian desire. That said, in reflecting critically on my own praxis and how I might revise it the next time around, I think an interesting and necessary turn-of-the-screw would be to have students conclude the semester by writing critical reflections on their own utopias in which they interrogate, as I did above, their engagement with social themes and course material. This would involve asking them to speculate on the possible dystopian tendencies and outcomes intrinsic to their utopian designs and to the practice of utopia generally. Is utopia an inflexible blueprint for an ideal state that ultimately leads to totalitarianism as some critics have asserted (Popper 1994), or is it fundamentally a “principle of hope” without which humanity is lost (Bloch 1986)? This reflective assignment may help to prod those students who registered little or no change from their initial frame to critically re-examine their held beliefs and venture new ones. The student’s comment points to the problem of agency that arises when simulation inside the classroom does not lead to comfortable assimilation outside the classroom, but instead provokes utopian “social dreaming” that arouses the sweet yet unsettling “desire for a better way of being.” The perceived disconnect between what is desired and what is possible risks producing the “miniutopia” that Bowles and Gintis and Stanford warn against. Yet, if my critical simulation created a miniutopia, the problem, in this case, is not so much that it left students “lacking a political understanding of their predicament” as Bowles and Gintis fear, but that the students lack a ready-made outlet for transformative practice with which to apply the political understanding actually garnered from the experience of simulating utopia. As a result, the risk of critical simulation is that the newfound utopian desire it produces may remain confined to the utopian no-place of learning, where it is subject to indefinite deferral and deformation. This experiment with critical simulation raises a number of important discoveries and questions for educators interested in teaching critical thinking in any discipline. It demonstrates that critical simulations are engaging activities with the potential to situate meaning in ways that foster students’ critical thinking while enhancing comprehension of course material. As such, they provide a valuable supplement to standard teaching practices, such as reading, writing, and discussion. Though they require significant forethought, iteration, and time to develop, and sometimes result in minor setbacks as evidenced by my failure to incorporate specialized roles, these requirements and difficulties are true for effective teaching strategies in general and should not deter one from investigating this option. Furthermore, the replay factor alone may more than account for the initial investment of time and effort. Although the problem of where to channel the unsettling utopian desire for change unleashed by this technique remains open, it also highlights a challenge facing all educators interested in teaching critical thinking: how to bridge the divide between the space of practice and social dreaming carefully cultivated in the classroom, and the space of praxis and social change that awaits outside. In the end, I am content to have raised the utopian itch. For if, as Oscar Wilde famously proclaimed, “Progress is the realisation of Utopias,” then by simulating utopia with my students I have at least prepared them to decide what should come next. Alexander, Jonathan. 2009. “Gaming, Student Literacies, and the Composition Classroom: Some Possibilities for Transformation.” College Composition and Communication 61 (1): 35-63. OCLC 5104742867. Ansoms, An and Sara Greenen. 2012. “BUILDING TIES IN A STRATIFIED SOCIETY: A Social Networking Simulation Game.” Simulation & Gaming 43 (5): 673-85. OCLC 869959620. Bachen, Christine M., Pedro F. Hernández-Ramos, and Chad Raphael. 2012. “Simulating REAL LIVES: Promoting Global Empathy and Interest in Learning through Simulation Games.” Simulation & Gaming 43 (4): 437-60. OCLC 811568172. Barak, Azy, Cathy Engle, Liora Katzir, and William A. Fisher. 1987. “Increasing the Level of Empathic Understanding by Means of a Game.” Simulation & Gaming 18 (4): 458-70. OCLC 4651870131. Bernstein, Jeffrey L. and Deborah S. Meizlish. 2003. “Becoming Congress: A Longitudinal Study of the Civic Engagement Implications of a Classroom Simulation.” Simulation & Gaming 34 (2): 198-219. OCLC 437644078. Bloch, Ernst. 1986. The Principle of Hope. 3 vols. Translated by Neville Plaice, Stephen Plaice, and Paul Knight. Cambridge, MA: MIT Press. OCLC 742568955. Bowles, Samuel and Herbert Gintis. 1976. Schooling in Capitalist America: Education Reform and the Contradictions of Economic Life. New York: Basic Books. OCLC 1602016. Brewbaker, James M. 1972. “Simulation Games and the English Teacher.” The English Journal 61 (1): 104-09, 112. OCLC 1329259. Cazden, Courtney, Bill Cope, Norman Fairclough, Jim Gee, Mary Kalantzis, Gunther Kress, Allan Luke, Carmen Luke, Sarah Michaels, and Martin Nakata. 1996. “A Pedagogy of Multiliteracies: Designing Social Futures.” Harvard Educational Review 66 (1): 60-92. OCLC 425954250. Colby, Rebekah Shultz and Richard Colby. 2008. “A Pedagogy of Play: Integrating Computer Games into the Writing Classroom.” Computers and Composition 25: 300-12. OCLC 280989052. Colby, Richard, Matthew S. S. Johnson, and Rebekah Shultz Colby, eds. 2013. Rhetoric/Composition/Play through Video Games: Reshaping Theory and Practice of Writing. New York: Palgrave Macmillan. OCLC 818732780. Coté, Mark, Richard J.F. Day, and Greig de Peuter. 2007. “Introduction: What is Utopian Pedagogy?” In Utopian Pedagogy: Radical Experiments against Neoliberal Globalization, edited by Mark Coté, Richard J.F. Day, and Greig de Peuter, 3-19. Toronto: University of Toronto Press. OCLC 63125382. Crocco, Francesco. 2011. “Critical Gaming Pedagogy.” Radical Teacher 91 (Fall): 26-41. OCLC 755910754. Dundes, Lauren and Roxanna Harlow. 2005. “Illustrating the Nature of Social Inequality with the Simulation Star Power.” Teaching Sociology 33: 32-43. OCLC 662695047. Fisher, Edith M. 2008. “USA Stratified Monopoly: A Simulation Game about Social Class Stratification.” Teaching Sociology 36: 272-82. OCLC 662692592. Freire, Paulo. 2002. Pedagogy of the Oppressed. New York: Continuum. OCLC 43929806. Gaber, John. 2007. “Simulating Planning: SimCity as a Pedagogical Tool.” Journal of Planning Education and Research 27: 113-21. OCLC 4652701608. Gee, James P. 2004. Situated Language and Learning: A Critique of Traditional Schooling. New York: Routledge. OCLC 56026684. —. 2007. What Video Games Have to Teach Us About Learning and Literacy. Rev. ed. New York: Palgrave Macmillan. OCLC 172569526. Gilliom, M. Eugene. 1974. “Trends in Simulation.” The High School Journal 57 (7): 265-72. OCLC 10517405. Hertel, John P. and Barbara J. Millis. 2002. Using Simulations to Promote Learning in Higher Education. Sterling, VA: Stylus. OCLC 56609659. Holquist, Michael. 1968. “How to Play Utopia.” Yale French Studies 41: 106-23. OCLC 1770272. Kovalik, Doina L. and Ludovik M. Kovalik. 2007. “Language Simulations: The Blending Space for Writing and Critical Thinking.” Simulation & Gaming 38 (3): 310-22. OCLC 611132545. Krause, Tim. 2010. “Using Simulation to Teach Project Management in the Professional Writing Classroom.” The Writing Instructor. Accessed February 4, 2014. http://www.writinginstructor.com/krause. OCLC 662675048. Kroll, Barry M. 1986. “Explaining How to Play a Game: The Development of Informative Writing Skills.” Written Communication 3 (2): 195-218. OCLC 425403333. Lee, Joey J., Pinar Ceyhan, William Jordan-Cooley, and Woonhee Sung. 2013. “GREENIFY: A Real-World Action Game for Climate Change Education.” Simulation & Gaming 44 (2-3): 349-65. OCLC 4948331468. Levitas, Ruth. 1990. The Concept of Utopia. Syracuse, NY: Syracuse UP. OCLC 21975950. Martin, David S. 1979. “Five Simulation Games in the Social Sciences.” Simulation & Gaming 10 (3): 331-49. OCLC 41552194. Mead, Corey. 2013. War Play: Video Games and the Future of Armed Conflict. New York: Houghton Mifflin Harcourt. OCLC 828890722. McCall, Jeremiah. 2011. Gaming the Past: Using Video Games to Teach Secondary History. New York: Routledge. OCLC 654316727. McCann, Thomas M. 1996. “A Pioneer Simulation for Writing and for the Study of Literature.” The English Journal 85 (3): 62-67. OCLC 425949308. Nash, Gail. 2007. “Conference Simulation in an English Composition Course.” Simulation & Gaming 38 (3): 332-43. OCLC 639027147. Norris, Dawn R. 2013. “Beat the Bourgeoisie: A Social Class Inequality and Mobility Simulation Game.” Teaching Sociology 41 (4): 334-45. OCLC 5128212527. Popper, Karl. 1994. The Open Society and Its Enemies. Princeton, NJ: Princeton University Press. OCLC 177688. Raphael, Chad, Christine Bachen, Kathleen M. Lynn, Jessica Baldwin-Philippi, and Kristen A. McKee. 2010. “Games for Civic Learning: A Conceptual Framework and Agenda for Research and Design.” Games and Culture 5 (2): 199-235. OCLC 615277608. Ricoeur, Paul. 1986. Lectures on Ideology and Utopia. Edited by George H. Taylor. New York: Columbia UP. OCLC 13357978. Saliés, Tânia Gastão. 2002. “Simulation/Gaming in the EAP Writing Class: Benefits and Drawbacks.” Simulation & Gaming 33 (3): 316-29. OCLC 425758225. —. 2007. “Reflections on the GUN CONTROL Simulation: Pedagogical Implications for EAP Writing Classes.” Simulation & Gaming 38 (4): 569-80. OCLC 611132505. Sargent, Lyman T. 2001. “US Eutopias in the 1980s and 1990s: Self-Fashioning in a World of Multiple Identities.” In Utopianism/Literary Utopias and National Cultural Identities: A Comparative Perspective, edited by Paola Spinozzi, 221-32. Bologna: COTEPRA/University of Bologna. OCLC 494699098. —. 2010. Utopianism: A Very Short Introduction. New York: Oxford UP. OCLC 624411960. Schulzke, Marcus. 2013. “Using Video Games to Think about Distributive Justice.” Journal of Interactive Technology and Pedagogy 2: 1-19. Accessed February 4, 2014. https://jitp.commons.gc.cuny.edu/using-video-games-to-think-about-distributive-justice/. Shaffer, David W. 2005. “Epistemic Games.” Innovate 1 (6): n.p. Accessed May 5, 2015. http://www.taqniyat.com/cms_pdf/Epistemic_Games.pdf. OCLC 593833847. Shor, Ira. 1992. Empowering Education: Critical Teaching for Social Change. Chicago: University of Chicago Press. OCLC 25412216. —. 1996. When Students Have Power: Negotiating Authority in a Critical Pedagogy. Chicago: University of Chicago Press. OCLC 34558888. Simpson, Joseph M. and Vicky L. Elias. 2011. “Choices and Chances: The Sociology Role-playing Game—The Sociological Imagination in Practice.” Teaching Sociology 39 (1) 42-56. OCLC 5544663062. Sloan, Gary. 1978. “Writing as Game.” The English Journal 67 (8): 44-47. OCLC 425888001. Stanford, Nichole. E. 2012. “Teaching Toward Utopia: Complainstorming and the Pitfalls of Utopian Education.” Unpublished paper, 1-15. Sterman, John, Travis Franck, Thomas Fiddaman, Andrew Jones, Stephanie McCauley, Philip Rice, Elizabeth Sawin, Lori Siegel, and Juliette N. Rooney-Varga. 2014. “WORLD CLIMATE: A Role-Play Simulation of Climate Negotiations.” Simulation & Gaming January 9, 2014: 1-35. Accessed February 4, 2014. doi: 10.1177/1046878113514935. OCLC 5525873867. Thatcher, Donald C. and M. June Robinson. 1990. “The Unemployment Game.” Simulation & Gaming 21 (3): 284-90. OCLC 20550385. Thompson, E.P. 1977. William Morris: Romantic to Revolutionary. New York: Pantheon Books. OCLC 2967708. Torres, Maruja and Joseli Macedo. 2000. “Learning Sustainable Development with a New Simulation Game.” Simulation & Gaming 31 (1): 119-26. OCLC 358567532. Troyka, Lynn Quitman and Jerrold Nudelman. 1975. Taking Action: Writing, Reading, Speaking, and Listening through Simulation-Games. Englewood Cliffs, NJ: Prentice-Hall. OCLC 1093551. Troyka, Lynn Quitman. 1974. A Study of the Effects of Simulation-gaming on Expository Prose Competence of College Remedial English Composition Students. Doctoral dissertation, New York University, New York. OCLC 5665947. Wilde, Oscar. 1910. The Soul of Man Under Socialism. Boston: John W. Luce. OCLC 5430379. Dr. Francesco Crocco is an Associate Professor at Borough of Manhattan Community College (BMCC) of The City University of New York (CUNY). He received his Ph.D. in English from the CUNY Graduate Center and has published several articles and a book on British Romantic poetry and nationalism. His recent scholarship focuses on game-based learning, gamification, and utopian studies. With funding from a Title V grant, he co-designed Levelfly, a gamified learning management system and social network that was piloted at BMCC. He is currently a PI on an NSF-funded project to develop a video-game-based curriculum to improve math remediation for STEM majors. His forthcoming publications include an edited volume on the broad cultural impact of role-playing games and articles theorizing representations of work and play in utopian and dystopian literature and films. Dr. Crocco is also the co-founder of the CUNY Games Network and coordinator of the CUNY Games Festival, an annual national conference on game-based learning in higher education.